Out look of sea surface temperature anomalies for NINO region indicated in the right box. 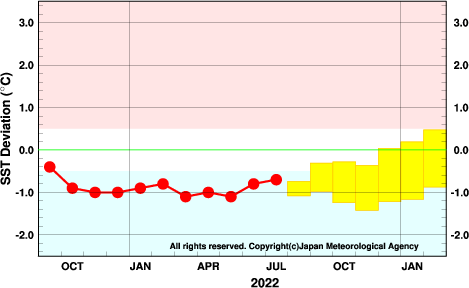 This figure indicates a time serise of monthly SST anomalies for each NINO region (NINO 3, NINO 3.4, NINO 4). Thick line with closed circles shows obserbed SST anomalies and boxes show predictions by El Niño prediction model for next six months. Each box denotes the range of SST anomaly with the probability of 70%. Base period for normal is 1981-2010. For each NINO region, area averaged monthly mean SSTs predicted by the model are displayed in a table (please follow the links below). In the table, the 'ENS' row represents ensemble mean values, and the 'UP' and 'LOW' rows represent upper and lower bounds of the boxes in the above figure.